You drive an AE, right Steve? I'm here. The dark side ruled Saturday night. Dougie did a good job. However Friday is a new day. Lol. Tim, thanks for the kind words. The motor worked out great at Delta as well. We havent raced since Norcal champs. He geared up and motor temps were still good w/ room for more if needed. He won another rookie race and wants to bump up early so for Delta he can but Norcal im gonna have him get one more win in rookie first. 1/10 electric this Friday night @7pm! hey mo, how's that motor working out for your boy? from the champs race, i found your son to be a good kid. very respectful and very into the hobby. i'll make it out to delta again soon hopefully. i really want to run the new layout. Good idea J. We have talked about that and its really the only way to go. Thats right racers! 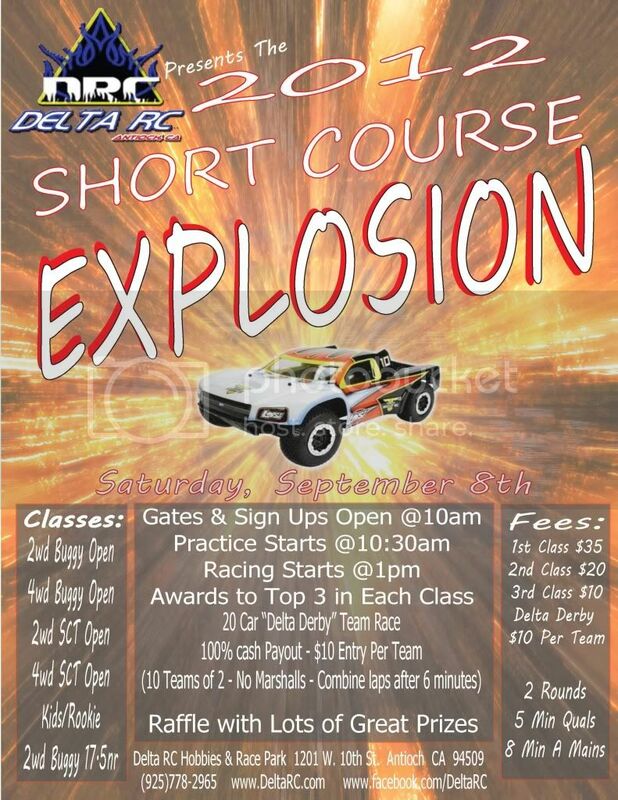 We are having our 3rd annual Short Course Explosion here @ Delta RC on Saturday September 8th. Last year the race was a huge success with nearly 100 entries and the first ever "Delta Derby." Last year it was Brian Dismuke and his teammate Jimmy Zapper taking home the $100 cash prize! For those who could not make it last year, the Delta Derby is a special event that we will run just before the main events. It is a team race. Each team has 2 members and there are 10 teams. Everyone races at the same time. There are no corner marshalls and you may not leave the drivers stand to marshall your car. If you flip over you have to wait till someone hopefully hits you or your teammate can come save you with his truck so you can both continue on. After the 6 minutes are up we will add both drivers from each teams laps together and come up with a winner. In the event of a tie, the tie breaker will be whichever team had the fastest combined single laps. This event was a lot of fun last year and it should be just as great this time around. Reverse will be allowed in this special event. Check out the flyer here for more info! Marlon its all good We all have moments once in a while and of course it takes 2 to tango so not all your fault Glad you like the layout it is def a lot of fun and fast. Another good night of racing again! Track is super dope and when you get your rhythm going on the technical jumps it just feels GOOD! I sucked but it was still a badass layout! Apologies to everyone for my actions on the drivers stand during practice. Just getting my kids back like anyone would. Regardless if my kid landed on dudes "$600 buggy" it was an accident. Yeah my kid made a smartass comment but so what. Hes a kid that also dont like drivers over reacting to an accident. The parent marshaling for rookie worked out perfect! This was the rookies werent cornering any of the faster classes. I threw on some super soft grid irons and learned that im just not ready for all that steering! Dammit Tony!!! You mean slowsi? Lol. No freakin way will I run a losi. Associated rules! @Srakow - You better not let the Darkside (Losi) win over you, fight the Bad People. @Dharris - Now that's one dirty buggy.